Summary and Definition: The JFK Assassination shocked the nation and tragically brought the presidency of John F Kennedy to an untimely and tragic end. The JFK Assassination took place on November 22, 1963 as the President was traveling, beside his wife Jacqueline Kennedy, in a presidential motorcade through the city of Dallas, Texas to attend a luncheon at the Dallas Trade Mart. At 12:30 p.m. CST, President John F Kennedy was fatally hit with two bullets, one in the head and one in the neck, and was rushed to Parkland Memorial Hospital where he was pronounced dead. Less than two hours later, at 2:20 p.m., Lee Harvey Oswald was apprehended at Texas Theater and interrogated in connection with the JFK Assassination at Dallas Police Headquarters. Two days later on Sunday, November 24, 1963, Lee Harvey Oswald was shot and killed by Jack Ruby whilst being led through the basement of Dallas Police Headquarters. The circumstances of the JFK Assassination and the death of Lee Harvey Oswald has led to the emergence of numerous conspiracy theories. 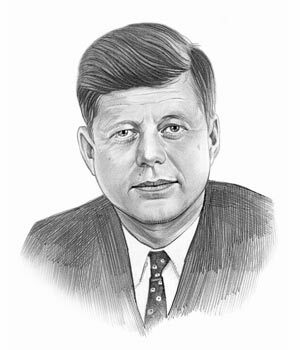 John F Kennedy was the 35th American President who served in office from January 20,1961 to November 22, 1963. His presidency came to a tragic, untimely end when he was killed in Dallas, Texas on November 22, 1963. This article provides facts and timeline of the JFK Assassination. The Dallas presidential motorcade consisted of the lead car, the Presidential limousine, the Secret Service follow-up car, the Vice Presidential car, the Vice Presidential Secret Service follow-up car, the Mayor's car, the National press pool car, three camera cars, three Congressmen cars, a military VIP car, the Official Party bus, the White House Signal Corps. car, two press buses, a local press car, a Western Union car and several additional cars. The following fact sheet contains interesting facts and information on JFK Assassination. JFK Assassination Facts - 1: 12.00pm: The presidential cavalcade begins its 10 mile (16-km) journey through Dallas Texas passing crowds of people, that were estimated at 150,000. JFK Assassination Facts - 3: Several motorcycles rode ahead of the cavalcade which was led by an unmarked white, hardtop Ford limo with police and secret service men on board. Two other cars in the Dallas motorcade were used for secret service and police protection. JFK Assassination Facts - 4: The President and his wife Jacqueline Kennedy traveled in the second car, a four-door, 1961 white, open topped midnight blue colored Lincoln convertible. The limousine carried the District of Columbia license plate GG 300. JFK Assassination Facts - 6: The President and Jackie Kennedy sat in the back seat. Governor John Connally was seated directly in front of the president as Nellie sat next to him in the middle row. JFK Assassination Facts - 10: 12.29pm: The presidential limousine entered Dealey Plaza from Main Street onto Houston Street as it slowly approached the Texas School Book Depository, now the Dallas County Administration Building. JFK Assassination Facts - 11: The Texas School Book Depository was an eight-floor building that faced Dealey Plaza, located at 411 Elm Street, and used for the storage of school textbooks. JFK Assassination Facts - 12: A man called Lee Harvey Oswald was working as a temporary employee at the Texas School Book Depository building during the presidential visit to Dallas. Lee Harvey Oswald was later arrested for the murder of JFK but was shot two days later by Dallas nightclub owner Jack Ruby. JFK Assassination Facts - 13: The presidential cavalcade turned into Elm Street, passing the Texas School Book Depository. JFK Assassination Facts - 14: 12.30pm: Shots were fired at the open limousine carrying President Kennedy. JFK was fatally hit with two bullets, one in the head and one in the neck. JFK Assassination Facts - 15: Texas Governor John Connally was critically injured by a bullet in his upper right back. JFK Assassination Facts - 16: Roy Kellerman was unable to use his own body as a shield, taking a bullet if necessary in the line of duty, because he was sitting at the front of the car. JFK Assassination Facts - 17: The driver, William Greer quickly accelerated the car, giving orders over the radio to the lead vehicle in the procession to get to the nearest hospital. JFK Assassination Facts - 18: Secret Service agent Clint J. Hill, was riding on the running board of the car immediately behind the president. As soon as the shooting began he leaped across and climbed from the rear bumper of the speeding presidential vehicle, scrambling over the trunk to the back seat towards the President. JFK Assassination Facts - 19: At the same time Jackie Kennedy, apparently in shock, was crawling onto the flat rear trunk of the moving limousine. JFK Assassination Facts - 20: Clint J. Hill pushed Jackie Kennedy back on to the car seat and covered her, and the fatally wounded president, with his body. JFK Assassination Facts - 21: 12.31pm: The presidential limousine, followed by other vehicles in the motorcade, rapidly exited Dealey Plaza into Stemmens Freeway and sped to Parkland Memorial Hospital, which was only minutes away. The following fact sheet continues with facts about JFK Assassination. JFK Assassination Facts - 23: A Roman Catholic priest, Reverend Oscar L. Huber, was summoned to perform the last rites for President Kennedy. JFK Assassination Facts - 24: 01.26pm: Lyndon B. Johnson and Ladybird Johnson leave Parkland Memorial Hospital for Air Force One to return to Washington D.C.
JFK Assassination Facts - 25: 01.33pm: At 1:33 p.m. White House Press Secretary Malcolm Kilduff entered a room at the hospital filled with press reporters and made the official announcement of the president's death. The official announcement stated, "President John F. Kennedy died at approximately 1:00 CST today here in Dallas. He died of a gunshot wound to the brain. I have no other details regarding the assassination of the president". The news was broadcast on radios across the nation. JFK Assassination Facts - 26: 01.48.pm: CBS News interrupted the television soap opera "As The World Turns" as Walter Cronkite emotionally announced that President John F. Kennedy had been shot dead. JFK Assassination Facts - 27: 01.50.pm: An angry confrontation breaks out about the removal of the president's body between JFK's special assistant Ken O'Donnell and other Secret Service agents) with Parkland Hospital doctors, a justice of the peace and Medical Examiner Dr. Earl Rose. JFK Assassination Facts - 28: They argue that the removal of President Kennedy's body may be illegal, as it was done before a forensic examination could be performed by the Dallas coroner, which was against Texas state laws. JFK Assassination Facts - 29: 02.00pm: President John F. Kennedy's body was placed in a solid bronze casket and removed from Parkland Memorial Hospital and driven straight to Air Force One, accompanied by the First Lady. JFK Assassination Facts - 30: 02.15pm: The hearse carrying the bronze casket with the body of JFK arrives at Love Field Airport, Dallas. JFK Assassination Facts - 31: Jackie Kennedy refused to change from her pink Chanel suit, insisting on wearing the suit, stained with her husband's blood, during the swearing-in of Lyndon B. Johnson and for the flight back to Washington, D.C. with the President’s body. JFK Assassination Facts - 32: 02.38pm: Lyndon B. Johnson was sworn in by U.S. District Judge Sarah T. Hughes as the thirty-sixth President of the United States of America, 98 minutes after the assassination of JFK. JFK Assassination Facts - 33: 02.41pm: Lyndon B. Johnson issues his first official order as president saying "Now, let's get airborne." JFK Assassination Facts - 35: 04.58pm: Air Force One touches down at Andrews Air Force Base in Washington D.C. and the casket is removed with due ceremony and taken to hospital. JFK Assassination Facts - 36: 08.00pm: A four hour autopsy was performed at the Bethesda Naval Hospital in Bethesda, Maryland. JFK Assassination Facts - 37: 12.00pm: The body of JFK was placed in the East Room of the White House for 24 hours during which time a private mass was attended by members of his family. JFK Assassination Facts - 38: Nov. 23: The next day, November 23, 1961, President Lyndon B. Johnson declared November 25 as the national day of mourning. Thousands of Americans waited in line to pay their respects as they filed past the casket. JFK Assassination Facts - 39: Nov. 23: The state funeral of John F. Kennedy, took place in Washington, D.C. during the three days that followed his assassination. The poignant image of his young son, saluting his father's coffin, haunted the nation. JFK Assassination Facts - 40: Nov. 25: On Monday November 25, President John Kennedy was laid to rest at Arlington National Cemetery. JFK Assassination Facts - 41: Following the tragic events Jackie Kennedy said the words from one of the presidents favorite songs from the 1960 Broadway musical 'Camelot' kept going through her head. The words were "Don't let it be forgot, that once there was a spot, for one brief shining moment that was known as Camelot..."
The following John F Kennedy video will give you additional important facts and dates about the political events experienced by the 35th American President whose presidency spanned from January 20,1961 to November 22, 1963.